Waterhall Joinery Ltd were approached after Christmas by a lovely couple whose house had been extended, the result incorporated a modern, more open living space. This consisted of a large lounge / diner leading to a large kitchen. Whilst they both loved the feel of space that they had gained, they realised they needed to look at the option of having sliding doors incorporated within the design. The link between the kitchen and the lounge/diner, was a double width doorway. This gave an amazing feel of space and continuity through the living area, but they felt that although this doorway worked well, it would be nice to occasionally be able to close the kitchen off (especially as they had a large dog as part of their family). Our clients had seen an American Barn Door sliding system in a magazine and thought this would be ideal as an addition to the room. Not only would the bespoke sliding doors be a feature, the contemporary style of the running gear itself would be eyecatching, and would create the perfect divide between rooms as required. When the doors remained open, the design would entice you to observe the doors and mechanics closer as unsual a feature. Having reached a full brief with the client, the doors would be glazed to retain the light and spacious nature of the living area, which would tie in with the windows design. 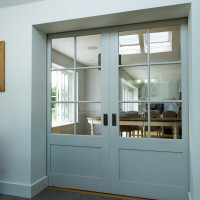 Waterhall Joinery researched the availability of American Barn Door sliding systems. 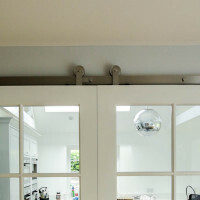 The doors would be quite a heavy load, we needed to ensure that the sliding systems would be robust and reliable. Having researched, we discovered that these systems are unavailable in the UK, so we needed to liaise direct with Real Hardware in America, to have the system manufactured to our specifications. 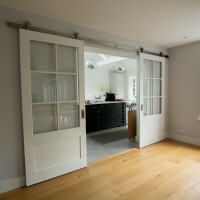 We designed and created the double doors for installation, this all went well, the next nerve-wracking part was awaiting the delivery of the materials from Real Hardware. Our measurements had to be incredibly precise, and the materials needed to be true in their style and suitable for the project. We needn’t have worried. Their service was first class, they had our bespoke order completed in an impressive 5 days from order to delivery. We were ready for installation and on fitting these two bespoke units together, they joined together like a hand in a glove. The doors perfectly captured the desired result. We were delighted in the combined mechanisms and craftsmanship. 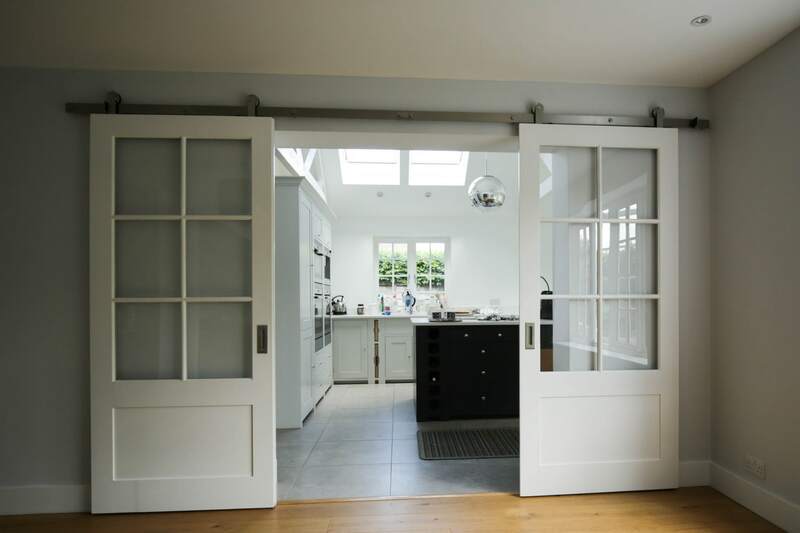 Our clients wish to create something different as a dividing feature, worked fantastically, maintaining their desire for open space, whilst having bespoke doors that would separate the rooms beautifully. 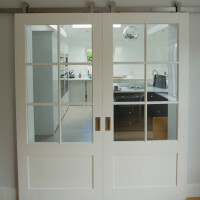 If you are thinking of sliding doors for your home, contact us to discuss further.